UniPi Axon is our latest PLC product line, designed to be used in monitoring, regulation, smart home, HVAC and many other applications. In its core, Axon is improved and redesigned variant of the Neuron product line. The development goal was to capitalize on Neuron's strengths and to further improve them. Axon thus retains a high degree of modularity and flexibility - two of our products' most significant advantages. 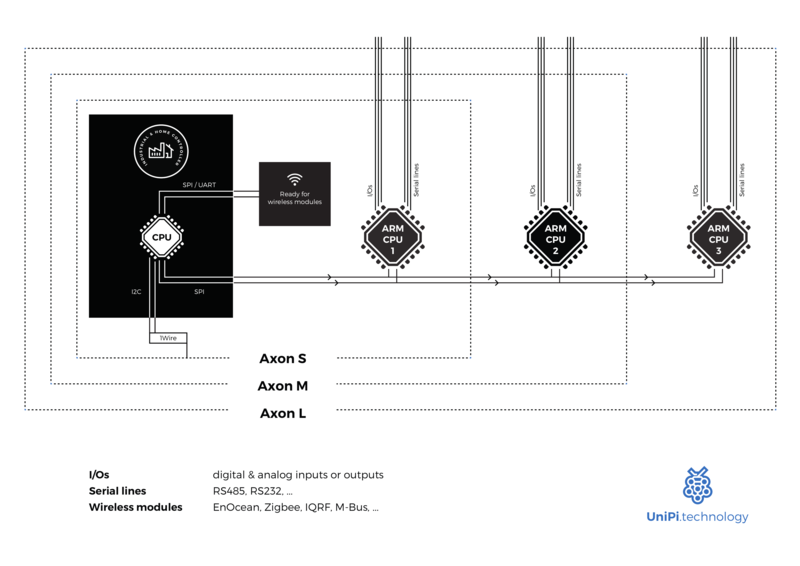 Axon controllers feature up to three input-output (I/O) groups depending on the model, each containing a group of inputs, outputs and/or communication interfaces. The Neuron can contain 1 (S-series), 2 (M-series) or 3 (L-series) I/O groups. On the Axon line, the Raspberry Pi 3 Model B computer was replaced by a more compact industrial computer powered by 1.2GHz Allwinner H-5 quad-core CPU. Aside from its more compact dimensions, the most distinct difference is the replacement of Raspberry Pi's microSD memory card with an 8GB onboard eMMC memory. That makes the Axon more reliable during frequent memory rewrites. The new computer is also provided with enhanced 1Gbit Ethernet and two USB 2.0 ports. 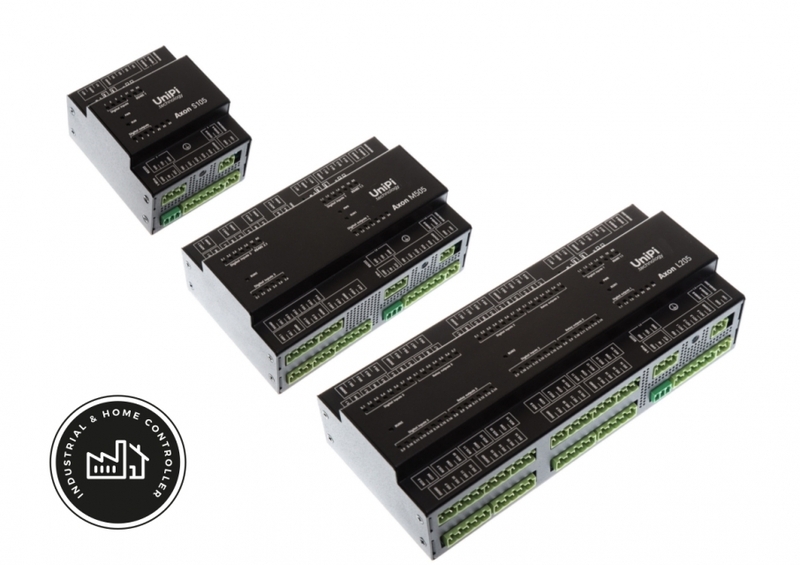 The RS485 most often utilizes the Modbus RTU protocol and can be used for communication with a wide variety of devices such as energy meters, touchscreen HMI panels, PLCs from other vendors or the Neuron xS extension modules. The bus can communicate with up to 32 devices with its total length being up to several hundred meters. 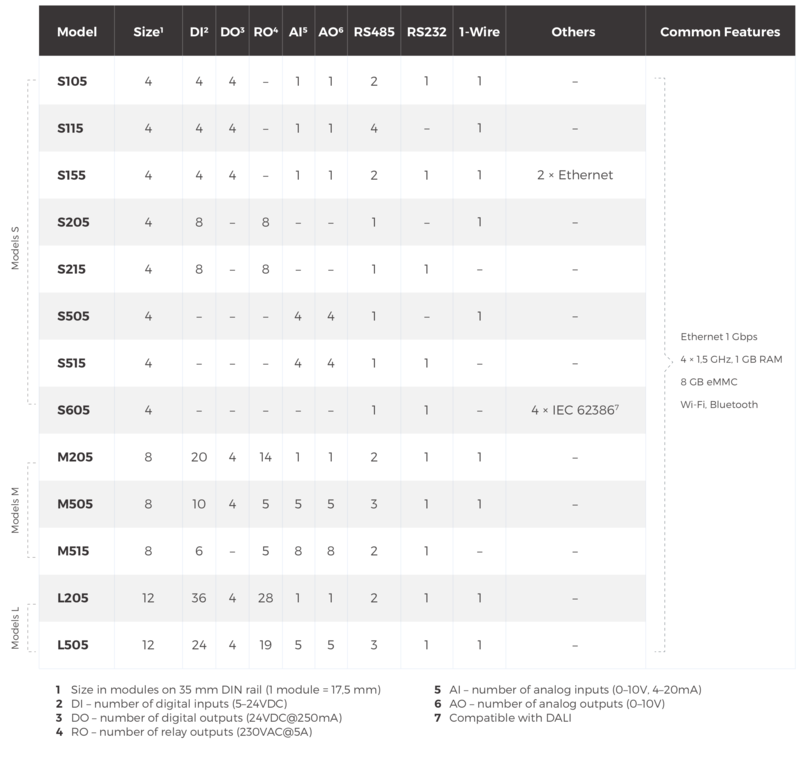 The RS232 serial line is most often used for communication with HMI displays, various gateways or closed technologies. The 1-Wire bus then can communicate with up to 15 sensors with maximum total length of the bus up to 100 meters, using either a 2-wire or 3-wire connection method.